Uchouten LOVE, much like the Fantasy DX DVD I talked about in my last post, has been another highly anticipated release. The last 4nin S/mileage single, it is the last hurrah of the S/mileage as we know it before the results of their new member auditions are announced in nine days. Is this a fitting end to an impressive era in S/mileage history and can it be the stepping stone to an even greater era? Read on to find out. Now before I talk about the single itself, let’s just talk about how it’s been doing on the charts. It debuted at #4 and dropped to #5 yesterday. Nothing special you say, that’s a typical ranking for S/mileage. While that may be true they are achieving this while competing with some heavy hitters. Heavy hitters like KAT-TUN and an AKB subunit. The fact that they are holding their own is quite impressive. It’s even more impressive when you look at their estimated sales for those first few days. 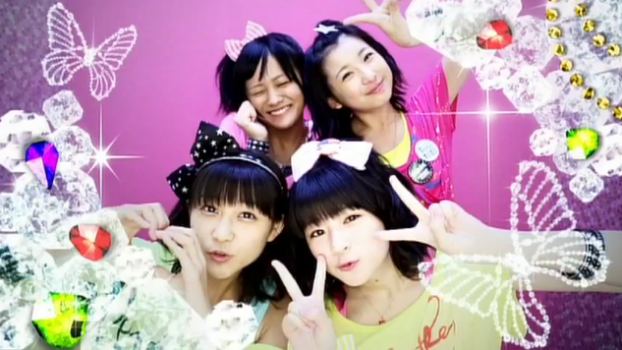 4nin S/mileage is going out with a bang! In one day they they not only tripled Koi ni Booing Buu!’s first day sales (estimated sales are 13,504) but they even managed to slightly surpass Morning Musume’s Only You’s first day sales (which were 13,209). Looking at estimated sales for the first two days combined, they’ve already surpassed the first week sales of their last single but also passed Berryz Kobo’s Ai no Dangan’s and °C-ute’s Momoiro Sparkling‘s first week sales. That’s quite an impressive feat to accomplish. Part of that succes comes of course from the fact that this is the last 4nin single. Much like Takahashi Ai’s upcoming graduation single, this release was bound to sell well. Yet on the other hand, it’s also due to a great promotional strategy. They released a 5-edition box set which sold out almost instantly, there were member specific covers sold at concerts, the girls have been doing event after event, there’s signed poster raffles coming and the bulk of their TV promo is still ahead of them. Oh, how I wished UFA would promote their other artists just as well as they did S/mileage. Now of course, all sales success aside, the main question is: is this a good release? Well of course it is. What did you expect? It wouldn't be a S/mileage cover if it wasn't leggy. The covers are very well done on all editions. I’ll admit I wasn’t the biggest fan of the whole pig gimmick and covers for Koi ni Booing Buu (apart from the awesome black version, which was the one I purchased) but this time I have zero complaints. The outfits look good and not gimmicky, the whole purikura vibe on some of the covers is very well done and the one seifuku cover adds just that one extra touch. First Press Bonus is a poster, which I've framed. Because I'm a framer. Of course this being a S/mileage release there’s not one, not two, but three songs to talk about. There’s Uchouten Love itself, there’s the cover of Chu! Natsu Party (originally by 3nin Matsuri) on the Regular Edition and Jitensha Chiririn, the song exclusive to the Limited Editions . I thought this pose was awesome. Uchouten Love is just a fabulous song. No it’s not Yumemiru Fifteen 2.0 like some people wanted. Instead it’s something completely different and original. It’s a parara filled electronic whirlwind infused with just enough Tsunku voice samples that it will either fill you with glee or drive you completely insane. The fact that I’m still not bored of this song even after hearing it being looped nonstop during the S/mileage audition livestreams says something about how much I enjoy this song. 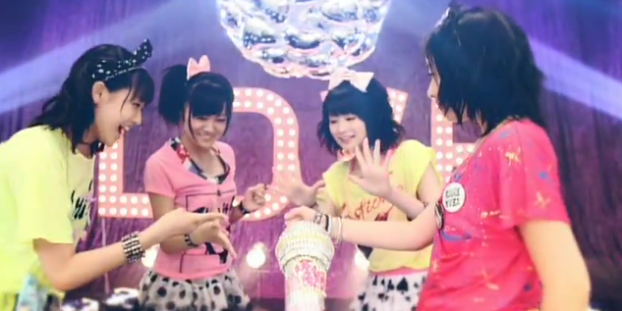 S/mileage: epicness mixed with a healthy dose of silly. 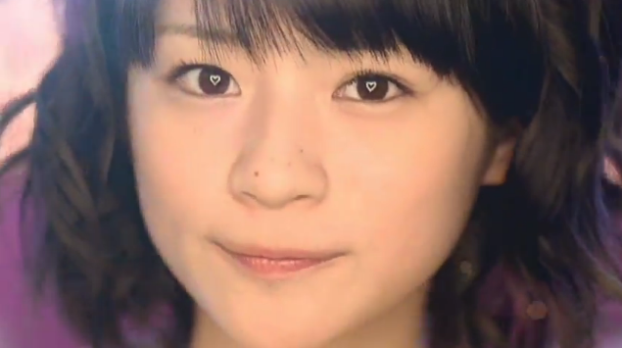 The PV is very well done, especially compared to some of the other H!P PV’s released recently. The budget appears to have been higher than usual and there’s enough variety and interesting shots to keep you entertained. The choreography for the dance also seems to be very well thought out, and most importantly, the girls seem to love it as well. In the end, all I can say is that Uchouten Love is an allround success. They have hearts in their eyes people. How can you resist this? I'm 100% convinced they glued that pencil on. All in all, another great release, a definite improvement on Koi ni Booing Buu and a great single for the 4nin to go out one. Here’s hoping they can build on this single and enjoy continued success post-auditions. If you enjoy this soingle and would like to support S/mileage you can purchase it on CDJapan or digitally on iTunes (Regular/Limited). Well some are saying they are the future of H!P. I don’t know about that but I’m glad to see they are doing well for the moment.